The are at least three major news this week in the crypto space. Obviously the talk of the town is regarding the SEC breaking its silence in relation to the ICO / DAO space. To be honest, we're a bit surprised at the panicking going around. - The DAO tokens were in fact securities. This is hardly surprising to anyone. The DAO was a decentralized venture/hedge fund. Token holders received a share of the profits of the funds. Surprising, but good I guess. - Other tokens sold through ICOs might be securities. Here the SEC is playing a smart waiting game. It's basically saying "hey, we're watching" - but it's not altering the long standing securities law framework that has been operating in the US for quite a while. And this is one of the reasons why we still haven't seen any "tokenized equity" projects done by pros. FWIW, high quality projects have been paying lawyers millions of dollars already to make sure they were not selling unregistered securities. - Exchanges, and individuals reselling tokens which are deemed securities, are violating securities laws. This, in our opinion, is the key message to take away from the report. This is the SEC's way of saying, "look, it's too hard to regulate issuing so we'll just tell you that you might be violating securities laws. BUT, if you are an exchange operating in the US or with US customers and you are hosting securities, then we know very well where and how to come at you. Also, if you're an individual who bought and sold securities, get scared". The most impressive thing for me was to see how much the SEC understands the issue and the depth of thought it put into this. The story is flawless and the analysis is precise. 1) Most projects will try to comply with US laws, and use CoinList to only offer a sale to accredited investors. This is obviously a massive win for the AngelList-backed company. 2) A minority will go for war. Anonymizing features will become more and more sought after even in asset-representing or usage tokens. Protocols like Zerocoin and the such will gain in popularity even more, with Coins implementing them following suit. Monero already delivered a pretty good result this week. This might be the first easiest massive and major use case for decentralized ledger technologies and smart contracts. The SEC can do absolutely nothing with anonymous tokens and decentralized exchanges. The attention of the SEC will then have to be targeted exclusively towards the issuers. In any case, we highly suggest reading the whole report. If you don't have time, a must read is Kyle Mitchell's 7 takeaways post. Interesting also the comments from Emin Gun Sirer, who says this is the end of beginning for blockchains. Not everyone has been playing in the grey zone. Some companies are pushing hard to comply with US laws, and LedgerX just received this week the authorization to open a fully-regulated Bitcoin options exchange by the CFTC. This is a major step in creating the conditions for institutional liquidity to play in the crypto markets. Also worthy of mention is Overstock's pioneering work with tØ. This was a major woah for me, and anyone who has been around crypto currencies for a good while. We were tipped that some major news was coming out, but wouldn't expect this. It started when Reuters broke news of the arrest of Alexander Vinnik, the founder of BTC-e. Soon after, WizSec, a Tokyo based BTC security firm who's been investigating the Mt. Gox hack since forever, published a post explaining that Vinnik is the main suspect for the infamous Mt. Gox hack and how they found out. So we are forking after all. I'd say the only thing to read if you don't know what's going on is CoinDesk's explainer. I, for one, am conflicted. I always think I don't have enough information to make a correct decision in supporting one or the other chain. Same as when ETH forked. This goes to show how complicated it must be for casual Bitcoin users who may not even ever hear about Bitcoin Cash and just be stuck with whatever their exchange or hosted wallet decides. Governance of decentralized protocols is surely one of the most intellectually stimulating aspects of the debate today. - Bitpay won't suspend service. Both Trezor and Ledger will have full support. This week Zeppelin Solutions announced zeppelinOS. This is a massively ambitious plan, and frankly a game changer for the ETH development community. zeppelinOS will provide a core kernel deployed to the blockchain that other dapps can call, API-like, as well as an asynchronous contract execution tool and a marketpace of inter-contract dapps and services. What prompted you to create zeppelinOS? We are super lucky to be working with the best projects and developers in the space through our security audit work and the OpenZeppelin community. This gives us an inside view of what our their main challenges are and where the industry is heading at. These learnings inspired us to work on zeppelinOS, as a way to solve most of the infrastructure and security problems related to smart contract development. Is this going to be Zeppelin's 'main thing' or will you continue to offer services? Zeppelin Solutions builds software to grow and protect the core infrastructure of an open, global economy, powered by blockchain technologies. The way we are doing this is by building a set of products, services and networks to allow businesses and consumers to participate in this open economy. zeppelinOS is our most ambitious project that aims to solve most infrastructure and security problems in the space today, and in 5 years time. How do you see the emerging blockchain tech stack developing? What are the next building blocks that need to be developed? We are at the very early stages of blockchain tech but a lot of work and progress is being done. We need to keep working on better scalability and interoperability solutions, languages, and debugging tools, among others. What's the most underrated project in the DLT space today? We see lots of great teams and interesting projects emerging these days, so it's hard to pick one. I'd say projects targeted to developers are underrated compared to those targeted to consumers, who mostly use cryptocurrencies for investment and speculation purposes. Fortune digs a bit into the story of Metastable, a crypto hedge fund co-founded by AngelList's founder/CEO Naval Ravikant. 🌎 Must read story about the Voltaire House in Buenos Aires, where Decentraland, Zeppelin, Streamium and bunch of other projects and people are based became what it is today. The future is decentralized, and distributed. Alex Miller announces his GRID+ stable coin on top of Ethereum and explains how stable coins can serve the whole ecosystem. It's an interesting piece to read, because Alex says: "I don’t think app tokens are the future." and points to fiat-pegged stable coins as the solution, which in this world is somewhat contrarian thinking. Estonia is bidding to become a haven for crypto projects, and aims to compete with Switzerland. They tout a smart blockchain regulatory framework and most of all verifiable online identities thanks to their e-residency program. Literally had shivers reading the story of the White Hat Group "saving" more than $200M for other people. The Ethereum community is one of the greatest communities I've ever seen in my life. Blockstack announces that they will try to become more and more decentralized, starting with a mining system and a Blockstack token. TL;DR Zeppelin found many, many bugs in the Serpent compiler. One of these bugs affected the REP token contracts, which would enable anyone to change the contract date and freeze the whole economy. Augur's team triggered it voluntarily so that no-one else could and are in the process of rewriting everything in Solidity. Every exchange has committed to upgrade the software. Man, is it early days. After a worrying silence from Protocol Labs, there was an announcement that the Filecoin ICO has been moved to Aug 7th. They also released a new primer and whitepaper, very much worth reading. To get started you can join the early miner program. We really could have done without it this week, but no. 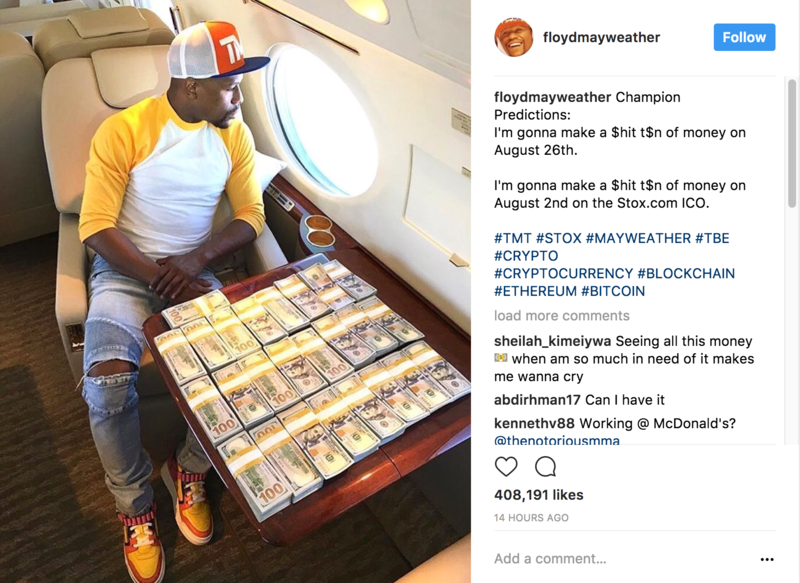 The ICO gods sent us Mayweather's Instagram where he poses next to a pack of 100 dollar bills professing he's "gonna make a $hit t$n of money on August 2nd on the Stox.com ICO". A Bancor founder is also an advisor, unsurprisingly. Maybe we're just the dinosaurs here, but we can't imagine that a legit project would need to do this. Avoid like the plague. A team member denounces the wrongdoings of the other founders of Quantum Resistant Ledger. This is why we can't have nice things, and why the SEC gets involved in this stuff. My main intellectual issue right now is figuring out how regulation can help here. These things also happen in regulated offerings, where the founder takes off and still draws a salary. The main difference is that in the crypto space a founder can liquidate all his tokens day-1, and still keep control of the whole things, while in a traditional equity structure they can't. Anyways, be careful out there. The highly anticipated new project by the Parity team has finally announced some details of it ICO (while the pre-sale is currently ongoing), a week after suffering a major hack. It will start in mid-August and will be in the form of a capped Dutch auction. The interesting piece of news is that tokens won't be released until Q3 2019. A platform that empowers anyone to build their own crypto hedge fund, by folks from the MIT Media Lab. In his traditional memo addressed to its clients, legendary value investor and founder of Oaktree Capital Howard Marks reserves two pages (out of 22) to crypto currencies (p. 15-16). He's clearly past the 'ignoring you' phase, which in itself is a big moment, however needless to say he's firmly in the 'laughing at you' phase (and he may never bulge from it in his lifetime): "But they are not real!!!!!" he states bluntly, calling them "nothing but an unfounded fad (or perhaps even a pyramid scheme)", and ascribing the meteoric performances of BTC and ETH to 'financial naiveté' and 'wishful thinking'. Russian biggest airline S7 and largest private bank Alfa-Bank started issuing airline tickets on the Ethereum blockchain with the aim of reducing settlement times down from 2 weeks. Chris Ballinger from Toyota Research Institute discusses how the Japanese automotive manufacturer plans on combining Blockchain, AI and machine learning technologies to develop the vision for autonomous vehicles. Fascinating how it's all coming together. Compound.vc (formerly known as Metamorphic Ventures) announced that they are committing a pool of capital from their fund to dapp developers who build on top of protocols they are investors in (for now: Blockstack and Gem). It's nice to see a VC firm try to keep up with the times and re-invent itself. They'll also be announcing a few other intellect investment initiatives in related areas that they are interested in. Another week, another tokenized fund ICO in the making. This one uses proprietary volume analysis algorithms from the spread betting arena to trade crypto currencies and promises a 40% annual return, through monthly dividends and token appreciation. More details on their Bitcointalk channel. $BTC is rallying ahead of Aug 1st, on not particularly strong volumes relative to the past week. Bitcoin dominance back up north of 50% for the first time since...May. Now that it's clear we are forking on August 1st, and holders of BTC will end up with the same number of the forked BCC, the illusionary prospects of 'free money' seem to be be pushing prices up. However it's worth keeping an eye on where the 'smart money' is placing bets: short positions have been building up steadily over the past 24hrs, almost 3x'ed, and the avg rate on BTC margin funding almost doubled overnight. Whales manipulating the market or event-driven hedge fund strategies at play there, that's beyond our pay grade. In the meantime $BCC futures have been trading on Chinese exchange viaBTC to the tune of $1-2m over 24hrs. Fun week ahead for day traders! Monero ($XMR), the anonymous digital currency, popped +20% on the day of the SEC announcement. Metastable, the high profile crypto hedge fund founded by Naval and backed by the likes of A16Z and Sequoia, announced ownership of 1% of the circulating supply of the currency (worth $6-7m at current prices). The FT quotes data from BofA showing how uncorrelated BTC returns are to other asset classes such as currencies, commodities, equities, interest rates etc.